While teaching some entry level Linux classes I often made use of the above diagram. (drawn on a whiteboard freehand) I kept promising to create a graphic and post it on my blog, I just never got around to it. Here it is now. 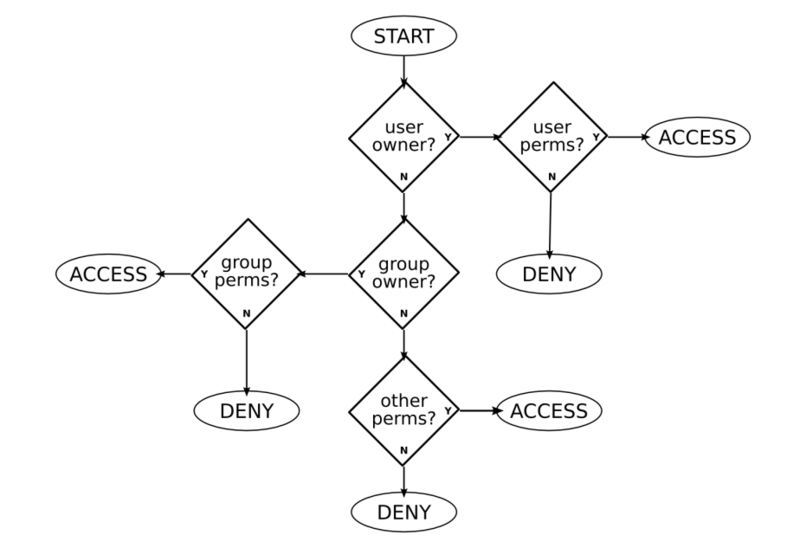 This image diagrams how UNIX permissions work. Basicly you begin at "Start", and if you are the "user owner" of the file then the user permissions apply, you are allowed or denied access. If you aren't the user owner of the file, but you are the "group owner" then the group permissions apply. If you are neither the "user owner" or "group owner" then the other permissions apply. Hopefully this will be of use to someone out there. As a matter of fact, I'm going to release this image, its svg source, and this corresponding blog post under the Creative Commons By Attribution Share-alike license. I'm offically no longer a Guru. At the beginning of this month I started work for the Florida Dept of Health. My official title is "Linux Support Analist" which means that I am the resident expert when it comes to Linux related stuffs. This is also the reason for the change in venue. My previous blog at GuruLabs has a great deal of information on it, which at some time in the future I may place here, but for the time being you can search my archives there. Look forward to the postings / rants / heated discussions both here and on the Utah planet.